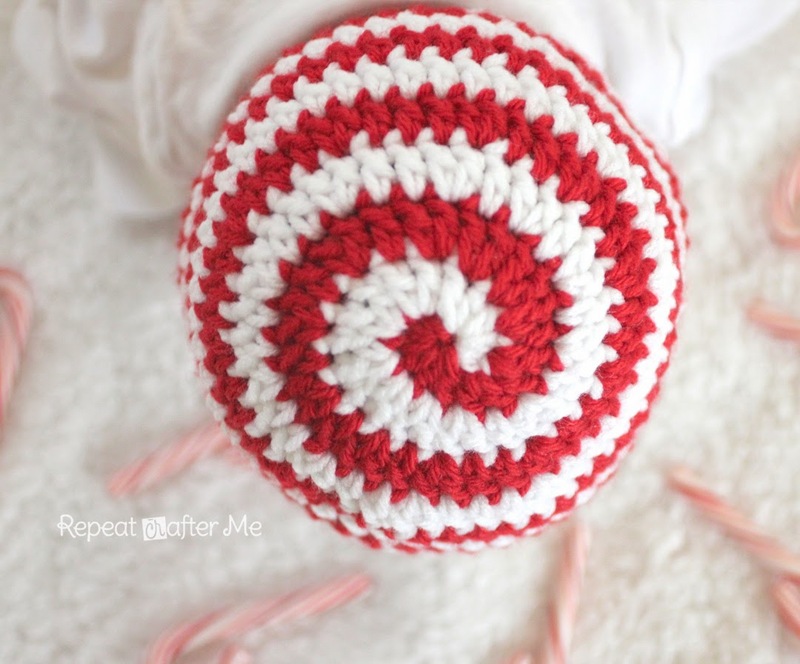 With it’s red and white swirled stripes, this crocheted candy cane hat is perfect for little heads this holiday season! Change the colors and you just have a fun swirly patterned beanie! This could pass for a lollipop hat as well 🙂 And the best part is that you don’t have to weave in any ends until the end. The pattern works up in continuous rounds. I will try to explain with pictures and a video tutorial. – Worsted weight yarn in red and white. Note: because of the large jumps in increases between sizes, you may need to try the hat on to make sure it’s a good fit. You can also check these standard beanie measurements to make sure your hat measures up. If it were me, and I needed an “in-between” size, I would make the larger size with a smaller hook. You can also make the hat longer or shorter…so for a 3 month old I might only make 11 rows and for a 6 month old I would make 12. You will see that listed in the pattern. Sorry for the poor video quality. One day I will have a more professional set up and better equipment. (with red) Make a slip knot, chain 1 onto magic ring loop, make 2 SC, 2 HDC, DC in ring, now pull tight. Round 2: (with white) 2 DC in next 5 stitches. (now switch to red) 2 DC in next 5 stitches. You should have 10 white DC’s and 10 red DC’s for a total of 20 DC’s for this round. To end, make a HDC, SC and slip stitch with each color and fasten off, weave in ends. I haven’t test the larger sizes… the teen/adult size seems large as it is written… If you make this hat let me know how it turns out in the comments! *** You may make and sell products from my patterns but if you do I ask that you link back to my post. Please do not copy and post this pattern and claim it as your own. Please do not re-publish photos as your own. *** Want more free patterns? Keep in touch on my Repeat Crafter Me Facebook Page for new pattern sneak peeks and when they will be available on my blog! I have a problem starting with magic circle. How else can hats be started? Thanks! Love your patterns! 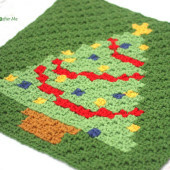 Carol you can Chain 3 or 4 then join with a slip stitch to form a ring, then crochet into that ring. But you will not be able to tighten your ring at all so I am not sure how well that would work for this style hat. So adorable, Sarah! You are so incredibly generous and your patterns work up well and look great! Thanks again! Thanks! this is adorable, and so creative! I am working on the teen/adult hat right now. It definitely wont be snug. I'm on row 12 now. When I finish I'll comment to let you know how it turned out–I'll also give you my head circumference–AND I'll post a picture on your FB page as well. This is lovely, Sarah! Would love to make it for my 2 year old nephew. What size should I follow? I'd make the toddler / child size for a 2 year old. My son is almost 2 and I will be making this in that size for him. I've just finished up to round 16. My head is 22" and this is 12" across laid flat so roughly 24" circumference. I am thinking of adding a sc border dec round to snug it up. I did round 17 as a dec sc round (dec every 10 st–so at 9/10, 19/20, etc.) but it was still looser around the brim than I'd like, so I took round 17 and round 16 out and did round 16 as a sc dec round (dec every 5 st–4/5, 9/10, 14/15, etc.) and the fit is better. It is still not snug and probably looser than I'd prefer. Before doing the dec round I had my husband try it on–his head is 23"–and he said it was too loose for him as well. Hope all this info helps. 🙂 I'll post a picture of the finished–modified–had on your FB page. Thanks so much for your help April! I really appreciate it and will have people refer to your comments! Oh, also I made the 40th stitch at the end of round 15–both colors–hdc before starting round 16 in a sc and at the end of round 16 I did a sl st after the 40th stitch and finished off. I did the adult size. I used H hook, left out row 8 and did 15 rows. It's not snug and a bit boxy in shape. Could have gone down to a G hook. Thank you Jillian! So happy to have a couple testers out there! G hook sounds about right! Ooohhh this is really awesome!!!! What size is an "h" hook in dutch sizes?? Hope you can tell me…. thank you!!!! So cute this hat. 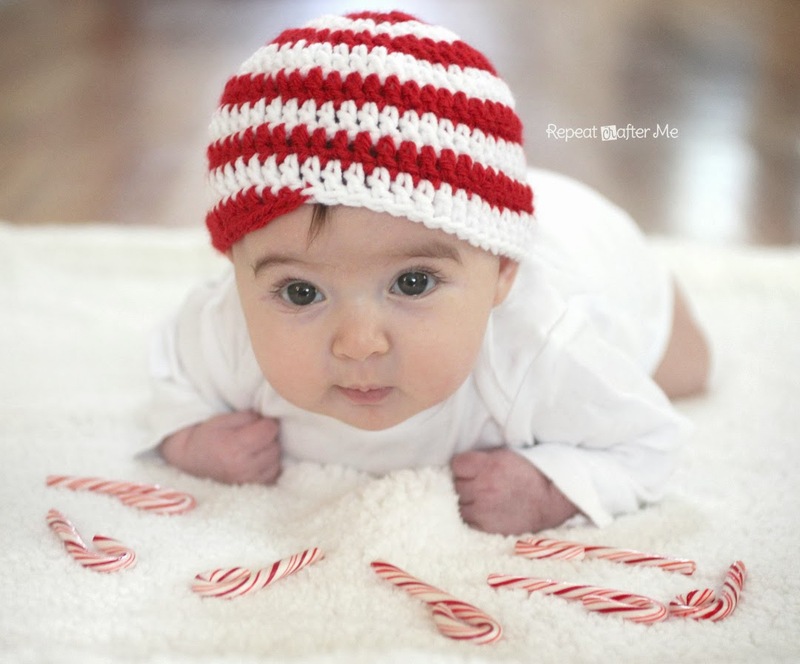 Adorable baby with this beanie. Thanks for the pattern. I love this hat!!! I did the toddler/child size for my friends little girl who is the same age as my tot. I added one more row to it because I like the entire ear to be covered up. It's a smidge big, but that just gives some growing room which I love too. I'm going to add a satin ribbon and sparkly button bow to fancy it up a bit. 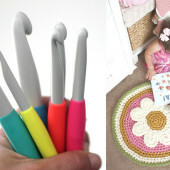 Very easy to follow and worked up really well in a few hours of stop/start crocheting! i just made this adorable hat!! It was for my 2 year old. i used camo and light pink bulky yarn! with a 6.5 hook it worked great. i used the directions for the toddler size but only increased to 40 sts. added a pompom on the top!!! LOVE it!!! Thanks Sarah!! 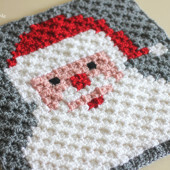 Just made an awesome version using Christmas red and white bulky yarn and an L size hook. I used the newborn hat pattern and hoped for an adult hat and it worked perfect. Only took 45 minutes using the chunky yarn and super cute. Wish i could add a picture. Thank you for sharing. I made the teen/adult hat using a chunky yarn and left out rows 7 and 8 and finished on row 13. It turned out really well! Ahhhh! Too fast!!! You are so talented, but I can't follow what you're doing because it's like watching Piccaso on fast forward! Please remember the beginners when you make these videos. I've tried this with the teen/adult size with an "h" hook, it was WAY to big for me. I tore it out until the 7th round and started going of the toddler/child specs and that seems to be better however, still big for me. Maybe I messed up doing the rounds in the beginning. I stopped increasing after round 7 but did do one increase in both the white and the red so that I would know where I stopped increasing in case I had to rip it out. I also measured the diameter and it was already at a little over 8 inches. I did a total of 15 rounds and then did TWO hdc and then a single crochet and then a slip stitch before finishing it off. It fits my big head with NO stretching. 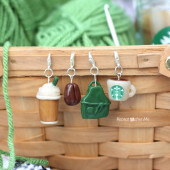 If I was to make one for my tiny little niece (21 yrs old) I would probably use a G hook as well. I did the adult size last night. It turned out to be the perfect size for hubby's head. I'll be writing a post about later this week. Thank you for your pattern, it’s beautiful!! Anymore so could make that?? adult size was way to big, even for my big fat head. so smaller hook? or HDC instead of DC? I just made the adult/teen size as directed, and it was a bit big, however, I omitted round 8, and added an extra round on the end, and it was perfect. The other sizes that i’ve done have all been great. What do you recommend for a preemie size? Beautiful pattern! I have started this hat and it is a easy and fast work up. I was shocked how easy it was. Thank you. I have found out that the adult pattern is pretty large so I skipped round 8 and went right to 9 and it is a tad big but it works considering everyone’s head is different sizes. :). On rounds 9-15, I have to add a few more rows to cover the bottom of the ears but this pattern overall is amazing and fast! Thank you for sharing this! I made the teen/ adult hat. The pattern was super easy to follow. I only increased to 70 stitches not 80. It was perfect. Thank you for this pattern.